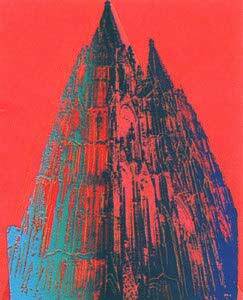 Cologne Cathedral: The cologne Cathedral is one of the most famous architectural monuments in Germany. It is also Cologne's most famous landmark. Cologne Cathedral is one of the world's largest churches, and the largest Gothic church in Northern Europe. Portfolio of four screenprints with diamond dust. Printer: Rupert Jasen Smith, New York. Publisher: Hermann Wünsche, Bonn, Germany.